SINGAPORE/KUALA LUMPUR (Feb 13): Malaysia’s national oil company Petroliam Nasional Bhd is paying for troubles at a state investment fund. 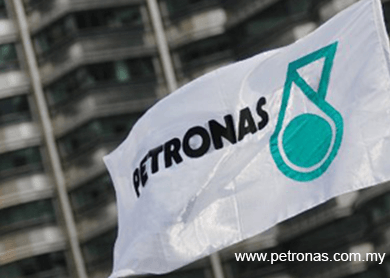 The yield premium on Petronas’s 2022 U.S. dollar- denominated debt over Treasuries has surged 53 basis points in the last six months after the government said it wasn’t liable for 1Malaysia Development Bhd’s debt and the fund missed a loan payment. That was unfortunate timing for Petronas, which is planning its first dollar bond in five years to raise as much as $7 billion, according to people familiar with the matter. The cost of insuring Malaysian sovereign debt reached a 16- month high on Jan. 13, one week after local media reported 1MDB’s missed payment, and is up 27 basis points since Dec. 31. Fitch Ratings said last month it may downgrade Asia’s only net crude exporter, citing plunging oil prices and “uncertainty” surrounding finances of the investment fund, whose advisory board is headed by Prime Minister Najib Razak. Petronas’s sale of dollar-denominated Islamic bonds may become its biggest such offer to date. It’s working with Bank of America Corp., CIMB Group Holdings Bhd. and Deutsche Bank AG to lead the offering, said the people familiar, who asked not to be identified because the details are confidential. The last time Petronas sold dollar notes was in August 2009, when it issued $4.5 billion of bonds. Fitch gives Petronas an A rating with a negative outlook, one level higher than Malaysia’s A- grade. Earlier this week, Malaysia named Wan Zulkiflee Wan Ariffin, a company veteran, to lead the oil producer, handing him the job of dealing with the slump in crude prices that’s eating into government revenue. Natural gas futures dropped to $2.58 per million British thermal units on Feb. 6, the lowest since 2012, while the price of Brent futures is down 49 percent since June. Petronas derived 21 percent of its revenue from gas and an equal amount from crude, with petroleum products being the biggest contributor to its top line, according to its 2013 annual results. About 30 percent of the government’s 225 billion ringgit ($62 billion) revenue in 2014 was oil related, including a 29 billion ringgit dividend from Petronas, according to the finance ministry. Petronas reported 119.4 billion ringgit of cash at the end of the third quarter, compared with 78 billion ringgit of total debt maturing within one year. A spokesperson for Petronas didn’t reply to an e-mail or answer a phone call seeking comment, and a spokesperson for 1MDB declined to comment. 1MDB has its origins in Terengganu Investment Authority, which was created in 2009 to invest oil royalties from the state of Terengganu. When Najib became prime minister that year, it was renamed 1MDB, became a national entity and its funding source became government-backed debt instead of oil income. In response to questions from opposition lawmakers, the government said Oct. 29 that it wasn’t liable for 1MDB’s debts if the company went bankrupt. The premium over U.S. Treasuries paid by 1MDB bonds due 2023 climbed 47 basis points over the following seven trading days. The investment fund failed to repay a 2 billion ringgit loan due in December, Edge Financial Daily reported Jan. 6. The spread on the 2023 notes soared 115 basis points in two days to 417 basis points. It had widened to a record 430 basis points on Feb. 11. 1MDB was given a third 30-day extension last month and the debt will come due at the end of February, people familiar with the matter said on Jan. 27. “It would be very difficult for the sovereign to walk away from paying if 1MDB were to face issues,” Sagarika Chandra, a Hong Kong-based Fitch analyst said by phone Feb. 12. The spreads on Petronas’s 2022 notes jumped 15 basis points over the eight business days after Fitch said on Jan. 21 that 1MDB’s financial position “has become a source of uncertainty.” Fitch also reiterated its concerns about Malaysia’s budget due to dependence on petroleum-linked revenue.